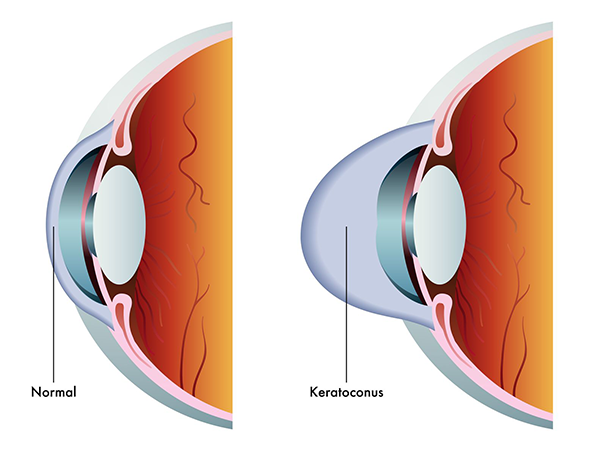 Keratoconus is an eye condition in which the shape of the cornea becomes distorted. The cornea is a clear structure that covers the front of the eye and allows light to enter the eye. In a healthy eye, the cornea curves like a dome. In an eye with keratoconus, the center of the cornea slowly thins and bulges so that it sags and has a cone shape. The cause of keratoconus is unknown. Keratoconus tends to affect younger people and the symptoms sometimes start in the early teen years and progresses most rapidly for the next 10 to 20 years. Often, eyeglass prescriptions must be changed frequently as the disease progresses. Keratoconus can usually be diagnosed with a slit-lamp examination as well measurement of the corneal curvature. Your optometrist will look for signs such as corneal thinning, stress lines, and scarring at the apex of the corneal cone. Keratoconus, especially in the early stages, can be difficult to diagnose and its symptoms could be associated with other eye problems. Simply recognizing symptoms does not by itself diagnose the condition. What is the treatment for keratoconus? The primary treatment options for keratoconus are contact lenses and surgery. In the very early stages of keratoconus, vision problems can be corrected with prescription glasses or contact lenses. As keratoconus progresses, special rigid gas permeable contact lenses may be necessary. Advanced keratoconus may require surgery.